برنامج Total Image Converter من البرامج الرائعة جدا والسهله ايضا في عملية تحويل الصور الى صيغ متعددة ليس هذا فحسب بل يمكن ايضا تحويل اي صورة الى صيغة PDF. 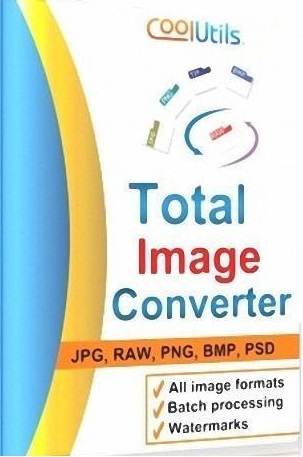 يدعم برنامج Total Image Converter تحويل الصورة الى اكثر من صيغة وبين العديد من صيغ الصور الشائعة مثل TIFF, JPEG, RAW, PNG, BMP, PSD, TGA اضافة الى العديد من الصيغ الاخرى. * Total Image Converter supports almost all image formats (see the list ->). It’s all-in-one solution for those who do not want to waste time and effort searching for 10 different converters to deal with different formats. * If you have hundreds of images to be converted, you can use its batch file convert option. Just check the files that you want to process or just press Select All button to save your time. Get any amount of image files converted or resized in one click! * First, there is well-thought user interface. Second, Total Image Converter seamlessly integrates into Windows. That means that you may select the file in your desktop and make right-button mouse click. You will see ConvertTo item in the standart Windows popup menu. And there is also Command line support. Run Total Image Converter from the command line within other programs. 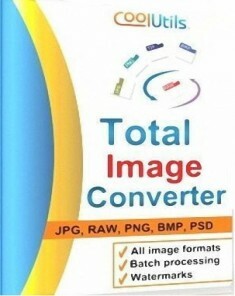 * Total Image Converter has built-in viewer. You may easily view your images inside the program before or after the conversion. You can either work with detailed list of files (name, size, type, modify, attributes) or with their thumbnails. * With Total Image Converter you can also resize, crop, rotate or mirror images and change the color resolution (include convert to black and white color) of your graphics. Besides, you may adjust White Balance and make gamma correction. Adjust or set Brightness, Contrast or Saturation, apply shadow or use some filter. All this done when converting your image with Total Image Converter! * Total Image Converter lets you apply watermarks to your images! You may add your comment, logo or date to a single photo or a bunch of them. * Even if you never dealt with image converters before you will master the program in seconds. The program will itself ask you all the questions about the conversion settings and in case you are at a loss it will advise you the best setting for each conversion. Click here to make a quick tour on the program and see how simple it is to use it.